What are in the package? You'll receive two flexible fabric gel arch support sleeves (3"W x 4"L) that wrap around your insole, perfectly placing the TPE gel cushion in the arch of your foot, giving full support to your feet, even while wearing shoes or boots. They may help ease pain and reduce inflammation. With a soft, mineral oil gel cushion, the hypoallergenic compression sleeves provide arch and mid-foot support that evens out foot balance and may help improve your overall comfort. All the pain from fasciitis, tendonitis, heel spurs and heel neuromas might be alleviated. They can be worn with or without a shoe and you would feel the relief in your arches almost instantly. How do I use them? Just insert your foot into the soft fabric sleeve, centering the gel on the inside of the sole of your foot, put on your socks (snug-fitting socks or compression socks are recommended), put on your shoe. The "L" (left) and "R" (right) indicator should be on the upper part of the foot. Position the black alignment mark so it lines up with the center of the big toe. The gel toe separator pad should rest in the middle of the arch. You can adjust for comfort and wear them throughout the day. Remove for at least 4 hours daily to allow the skin to breathe. Also, do NOT place a product on an open wound. One size fits all! How do I take care of them? Our spandex material and gel TPE orthotic supports are easy to clean. They are washable and reusable as well! Just wash the sleeve with soap and warm water and let air dry. Avoid overstretching and exposure to sunlight to prevent discoloration. Why are we different? Because Metarsal is run by physicians, we are committed to making you a happy customer. No matter what. The special anatomical shape of the product makes it suitable for any foot type. USEFUL: Great for use on all type of shoes, help the whole feet from hurting, heel pain, plantar fasciitis; with our effective arch support sleeves, back to normal physical activities as possible. 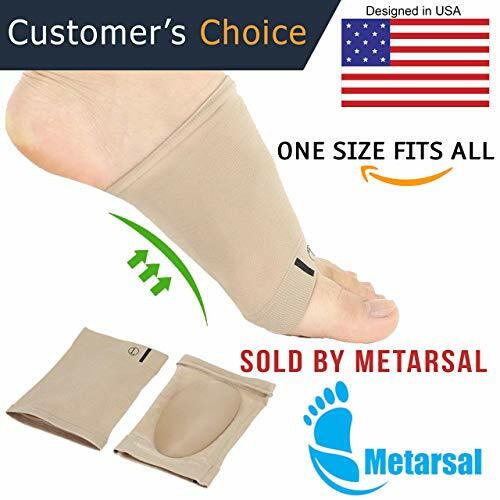 DESIGN FOR MOST FEET: Metarsal arch support sleeves are designed to fit any feet, stay in place securely, create long-lasting relief from foot & heel pain due to flat feet & plantar fasciitis. EFFECTIVE: Provide gentle, targeted compression to the arch to make standing and walking comfortable, support the foot inside without over tightening, can be worn all day, washable and reusable. QUALITY GUARANTEED: We offer a 90- day money back guarantee for a full refund if you are not satisfied with the products and return them within 90 days. If you have any questions about this product by Metarsal, contact us by completing and submitting the form below. If you are looking for a specif part number, please include it with your message.